Did you ever hear a song somewhere that made you stop and say, wow, what a voice... and what a song? That was the case with Tasmin Archer, when I bought one of those various artist compilation discs on a London trip. I've got a bunch of these at home, all stuffed with UK Top 40 and indie label hits at the time of their release. 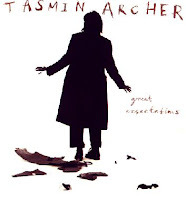 I had no idea who Tasmin Archer was, but when this song came on right after Annie Lennox's "Walking On Broken Glass," I was like wow, let me play that again. And I did... many times over. "Sleeping Satellite" barely scratched the surface of anything resembling a hit in the States, it made a brief blip and was then gone, so it became my song to put on friends' mix tapes and turn them on. In the UK, "Sleeping Satellite" went right to #1.
for a taste of man's.. greatest adventure. And it's on those "greatest adventure" words where she powers it up like a chainsaw and you know you are heading into an emotional ride, a really great song. With every subsequent chorus, more instruments come into the mix, the beat picks up slightly, the drums, guitars and keyboards increasing in volume and urgency, a handclap blending with the beat after the break, and a simple slightly detuned organ notes gliding around. I found a copy of Archer's debut album, Great Expectations, released on EMI, and I noticed on the cover that she was an attractive black woman singing rock. Of course, my initial thought was "here's another Tracey Chapman." Except where Chapman's sound was raw, dark and based in blues and protest music, Archer was much smoother and carried by London's top studio musicians. Unfortunately, nothing else on the album could match the impact of "Sleeping Satellite." Online, there are two different "official" videos for "Sleeping Satellite": the hokey somewhat gothic-visualed British version (I don't know what they could have possibly been thinking) with the song's original mix; and the completely different US version, which is fairly better and a different mix (with a noticeable electric guitar solo at the end). There are also numerous cover versions done by various artists from European countries, including a very slow "quiet storm" acoustic version by some Barcelona band, and a remix to a hip hop drumbeat! I'm going to spare you the UK video, and give you Archer's live performance on "Top of The Pops," followed by a really beautifully done anime cartoon using "Kingdom Hearts" clips done to the song (excellent acoustics too). Listen to this second one in how the drums get pushed up front when Archer finishes the second verse -- that's how to mix and arrange a song! Yes Tasmin Archer is a bit special. I really admire that song. Good post. I wrote this song with Tasmin. Thats me on the keys on TOTP. The track would have done much better in the states if Tasmin would have toured, but by that point she was sick of it all and i believe had some kind of break down. I did have a more successful Hit stateside recently with Corinne Bailey Rae's "Put Your Records on" but this track is very special to me. What is the keyboard used for the solo please?